Academic writing is definitely one of my low-frequency behaviors and if it doesn’t increase exponentially very soon, I’m in big trouble. Since I obviously find updating this blog very reinforcing (high-frequency behavior), I’ve decided to enforce the Premack principle in my academic writing behavior. With the excitement of the concert and the STAR tutoring session this afternoon, I totally forgot it’s time to turn the clock back an hour: end of daylight savings time. If there’s a single day that I have to vote as the most depressing day of the year (not considering other factors) I would say this is it. Even though I gain an hour today but the sun will set around 5pm today and will progressively set earlier and earlier till mid winter before it goes back the other way. I prefer long summer days where the sun sets at 8.30pm or later. Well I went for my first STAR tutoring session today. When I signed up, I didn’t think that it would start so soon and adding this to my calendar is sort of overwhelming at this moment in time…oh well… Anyway I have to do one-on-one tutoring for about 2 hours every other Saturday. On STAR days, tutors have to be there before noon, have lunch with their tutee(s), we had chicken fingers, cheese pizza, french fries, and cookies, and then go on to the one-on-one tutoring. My tutee, Barbara, is an eleven year old 6th grader. She’s very independent and pretty much did all the work without much help from me. She was working on her Math homework and she has to determine, via mental mathematic, whether a certain number e.g. 2332 is divisible by 2,3,5,9 and 10. It’s been a long time since I had to crank up that part of my brain! Both Third Day and the David Crowder Band are Christian bands. I’ve heard a few of their songs and was looking forward to this concert. I didn’t really know what their styles would be like. The music was loud. The earth literally trembled under my feet. I have to say I like David Crowder Band a little better because I could follow the lyrics where as for Third Day, I couldn’t really hear the words of the songs. But Third Day’s half of the show had more spectacular light shows. Since the videos that I took at Musikfest turned out pretty good, I was all prepared to catch some videos on my digital camera. And I did, I caught 4 short video segments, two of each band. I came home and downloaded the videos to the macbook and was horrified that the sound quality was really bad, very much like a bad pirated VCD 🙂 I guess the volume and sound system of the place overwhelmed my lowly digital camera. This video was the only acceptable one among the four. Third Day sang “Born in Bethlehem”, a new song from their recently released Christmas album. Enjoy! 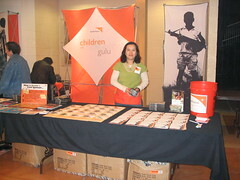 This evening, Marvin and I, were World Vision volunteers at the Third Day with the David Crowder Band concert at Lehigh. As volunteers, we had to get there early (4.30pm), go through a brief orientation, don an apron and a name tag, and hold on to some WV’s child sponsorship materials. Before the concert started, we handed out small cards to concert goers to fill in and drop into the orange bucket. Once the concert started, we could settle down to watch the concert (for free). During intermission, a lucky draw took place (from the orange bucket) and one very fortunate person went home with a Third Day pack (3CDs and 2 DVDs). At this time, I had to hold up a child sponsorship packet and walked (more like climb up the bleachers) along the aisle. If anyone is interested, I explained to them what this is all about and help them fill up the forms. Sponsoring a Hope Child (children living in AIDS/HIV ravaged countries) costs $35 a month and sponsoring a Children of Gulu (war children of northern Uganda) costs $20 a month. After the intermission, settled down again for remainder of the concert. Just before the show ended, we had to wait in the concourse area and once again holding up the child sponsorship packet. I managed to sign up one Hope Child sponsor and one Children of Gulu sponsor. Then when the place started to clear out, we returned the apron and materials, each grabbed a World Vision pen as a souvenir and headed home at around 9.30pm. All in all, a very enjoyable and meaningful way to attend a free concert. Today, for the sake of free pizza and soda, I attended the graduate student senate (GSS) meeting. I used to be one of the department’s student representative, but dropped that position this year. Too many things on my plate. Anyway, one of the student was looking for volunteers to be S.T.A.R. tutors. I’ve wanted to do this before, but the program was/is on Saturdays and previously, without the car, I’m always stuck at Duh on the weekends. This time I can actually do it, so I volunteered. It’s an alternate Saturday commitment, about 2 hours each time. As for the GSS meeting, we (but I only ate and listen) discussed about trying to reduce the technology fee that graduate students have to pay every semester. This broadband connection is not free, I’m paying $150 per semester! And two new grad student clubs were installed: Chinese Folk Dance Club and the Association of Optical Engineers. Chinese folk dance? That’s baffling. Anyway another student talked about a new club that he wanted to add to the GSS: the cricket club. He was saying that it’s called the gentlemen’s sport and that the team is currently playing competitively. When asked whether women could join the club, he said yes. When asked whether women could play in the tournament, he said since it’s a technical game and it takes a long time to be good at it etc etc…ultimately he said no, but women can join the club and play the easier game and use a tennis ball instead of full cricket gear. I don’t know…if I happen to be at the next GSS meeting when they vote to install this club, I may vote against it. Just because I don’t see women having meaningful participation in this club, and since they do play competitively, I would guess they wouldn’t really have many “easy-use-tennis-balls” game. Not that I want to play cricket, ever since the thumb injury, I’ve developed a phobia of any sport that requires a bat and a ball. Even watching baseball on TV is painful. Then we discussed what constitutes an open event held by student clubs, and what clubs must do to advertise the open event, in order to receive funding from GSS. There’s also 2 Halloween parties this Friday, and any student who comes to the party dressed as a “graduate student” would be forced to perform the Monster Mash dance on stage. And after a few other announcements, including one about the Jingle Bell Run, the meeting ended. I have to rewrite the introduction and methods sections. I wrote the original proposal semesters ago and since then there are several more important research articles that have been published and that I have to include in the introduction section. I had my first interrater reliability training today. I trained a fellow student to help me in coding the research articles that’s in my meta-analysis. And I have 2 more training sessions with two other students in the next two days. And once that’s done, I’ll have to wait for them to finish coding the articles that are assigned to them, and then compare their results with mine. If our interrater agreement is 80% and above, then I’m OK, if not, I’ll have to refine my codes. I still have to review my own coding and do some fine-tuning before I run some statistical test. I’ll also have to make an appointment with the Stats professor just to double check that I’m doing the right statistical tests correctly. Then I’ll have to write up the results and discussion sections and explain why I got what I got and what the implications are. And all this time, sending my drafts to my advisor for feedback. Then I’ll have to submit the finished paper to the four professors in the department and work on the presentation scheduled on December 8. Right now I’m working on “abstracting” (summarizing) 3200 lines of interview transcript for the qualitative part of the research grant. Each transcript takes me about 10 days (3hr per day) to complete. I’m trying to finish the current one by Thursday, and then I still have more transcripts to go through. And this job can be frustrating when I have to keep the interviewee’s words but at the same time making sure I summarize the big ideas. And I also have to look for research articles for my advisor’s workshop in January. On November 2, I have to drive 1.5 hrs to Grantville, PA, for the PA Council of Exceptional Children conference. I call it a “booth-sitting” session, mainly there to promote the department’s programs. I am currently a teaching assistant (TA) in the Applied Behavior Analysis (ABA) class. I like the science of ABA, unfortunately in real-life-applied-classroom settings, behavior is almost always never clear cut and distinct. Behavior is often messy and makes terrible graphs. Anyway as a TA, I have to grade homeworks and final projects, and next Monday, I’m teaching the class on Generalization and Maintenance. So this week I’ll have to work on the powerpoint presentation and may be come up with some activities for the class to do. And being the TA, I have to help students in their final projects… a lot of problem-solving involved, which I find that I like doing. I am organizing a farewell party for my friend, Marvin, on November 11. He is graduating and moving to North Carolina soon. This doesn’t take a lot of time, just need to contact some friends, reserve the community room for the gathering, and make sure there’s food on the table on that day. This Saturday, October 28, I’ll be volunteering for World Vision at their booth during the Third Day with the David Crowder Band concert at Lehigh. I managed to rope in Marvin for the volunteering job. We get to watch the concert for free. So I have to be there by 4.30pm and stay till maybe 10pm. Mei came over for dinner this evening. 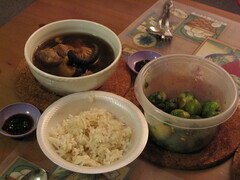 When I asked her what she would like to eat, she said, “Bak kut teh,” so that’s what I made. I also microwave-steamed some frozen brussel sprouts with garlic oil and oyster sauce. Both of us had a good time polishing off the whole pot of bak kut teh. 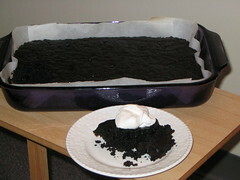 Then we each had 2 servings of Diet Pepsi Chocolate cake with cool whip topping, while watching a dvd. Today I decided to go back to the 13-week walk/run program and followed week 9-session 1 schedule, which is run 10 minutes, walk 1 minute, run 20 minutes, walk 1 minute, run 15 minutes, walk 1 minute, run 10 minutes….58 minutes altogether. Temperature 13C. I made this diet soda “birthday” cake from a can of Diet Pepsi Vanilla, a box of dark chocolate fudge dry cake mix, and nothing else. No eggs, no butter, no oil. It’s slightly crumbly but still quite moist. Unfortunately, the blue cake decorating gel (leftover from last year’s birthday cheesecake decorating project) would not show on the dark cake, so I couldn’t write anything on it. And I left Darth Tater in my office to guard over my desk, so he couldn’t make it for this year’s photo. The temperature is slowly dropping outside and my room is now constantly at 18C or lower. And because heat costs money, I’m holding off turning on the heater till sometime in November and even then it’ll be set at the lowest setting. So from now till April, I’ll be suffering from a condition called chronic CHF (cold hands and feet), but I do get some temporary relief when I’m in my office, where it’s toasty and warm. I’ve decided that 15C temperature is the best temperature to run in. Yesterday, I got home early and went out for a run. This time I ran 10 mins, walked 1 min and repeated that 4 times. I’m amazed I could do that. Once upon a time, I couldn’t even run continuously for two minutes. Jingle Bell Run, here I come! An important deadline is approaching-December 8- the day I have to present my qualifying project to the faculty. I have to rewrite my introduction and method sections, analyze and interpret the results of my PBS meta-analysis, and write the results, discussion, and conclusion sections. I’ll also need to recruit several friends to help me code some articles for reliability purposes. 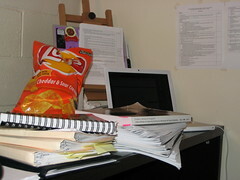 Here are all the important materials that I have to reread and review, and my favorite Lay’s Cheddar and Sour Cream potato chips to keep me going.